"Truth be told that this documentary not only told the story of Richard and the Young Lions, their incredible 45's, and why Richard & the Young Lions got robbed out of a top 10 hit, but the story should also be mandatory viewing for all aspiring bands. The story is factual but yet funny. You can laugh, and you can cry. When it's all over, you will know so much more about those cool 45's released by Richard and the Young Lions. You will know what it's like to be in a rock & roll band!" "I thoroughly enjoyed this documentary. It is a powerful story, well told. The point -- that this music that RYL made together was strong enough, even after 30 years(!) to pull them back together and to get the ailing Richard Tepp out of bed in the morning, to keep him going and to make him willing to drive long distances just to play -- is very evident. For a real story of underdogs who get bad breaks left and right but simply refuse to give up, you just can't beat "Out Of Our Dens." An impressive directorial debut for James Hannon!" 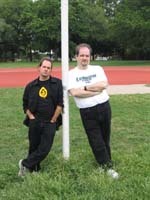 Hi there, welcome to Lantern-Media.com - the official website of James Hannon, author of "Lost Boys of the Bronx - The Oral History of the Ducky Boys Gang", and producer of the documentary "Out of Our Dens - the Richard and the Young Lions Story"
Buy a signed copy of Lost Boys of the Bronx and get free stuff! 8/19/2006 - Back to the Bronx - A Ducky Boy actor and a journal started! Had an interview with Konrad Sheehan up in Van Courtlandt park yesterday.. Konrad played a Ducky Boy in the Wanderers and the leader of the Punks gang in the Warriors movie. He is also one of the nicest and down to earth people you could know. Full details and pictures below in my new Journal feature. I've been writing this stuff down in my personal files from the beginning, and decided to share some key documentary filming events with readers of my website. Hope you enjoy! NYC-TV airs an episode of the show Cool in Your Code-The Bronx that covered the new changes to the Loew's Paradise Theatre in the Bronx. A few pictures from my friend Raymond Ruiz & my trip to the Paradise were used in the episode and we have a credit there. Its always fun to have your work shown on TV - even if it only airs in the NYC area.. And thanks to Tivo, we have video footage of the Loew's Paradise segment for you!!! On April 15th 2006, I went on the first official tour offered by Loew's Paradise since their renovation. And it looks magnificent! The Paradise was a I had only been to the Paradise in the 70's and 80's and back then it was a duplex and quad theater, and to see it now as i one huge theater/concert hall is something amazing. When i walked out on the top balcony and saw the hall for the first time, my breath was taken away! Pat St. John is onboard as the narrator for our Bronx Gangs documentaries! We are honored to have Pat onboard -- For those that don't know, he is a legendary radio personality in New York (WPLJ, WNEW, CBS-FM) and Detroit (CKLW, Keener). He is currently on Sirius Satellite radio. He is also the voice of Out of Our Dens - The Richard and the Young Lions Story and a true professional and pleasure to work with. A Bronxites Tribute to the Wanderers movie is now up! How the Wanderers movie influenced a Bronx native's life more than once. Lots of current cool pictures from the Fordham Road - Bedford Park Blvd area! 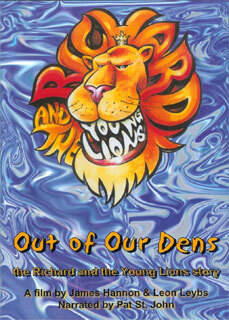 Our film Out of Our Dens - the Richard and the Young Lions Story is an official selection of the 2005 Anchorage International Film Festival happening between December 2nd and 9th, 2005! Lantern-Media.com has finally made it into the 21st Century and joined MySpace! Check out http://www.myspace.com/lanternmedia and let us know what you think. On October 1st, 2004 "Out of Our Dens - The Richard and the Young Lions Story" had the honor of being selected as a finalist in the Hope and Dreams Film Festival! The RYL documentary is now in the Rock & Roll Hall of Fame!! (Well sorta) - I Just received a postcard from Terry Stewart - President of the Rock & Roll Hall of Fame (aka the "RockHall") who just watched Out of Our Dens: The RYL Story that I had sent him.. He wrote that he loved it and that the DVD is now in the Rock & Roll Hall of Fame archives! Copyright ?Lantern Media, Inc. All rights reserved.